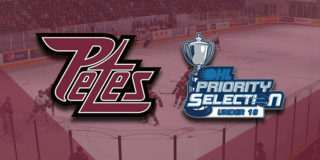 The Petes wrapped up their four-game week with a 7-4 win in Mississauga on Sunday afternoon, finishing their regular season series against the Steelheads with a 2-1-0-1 record. 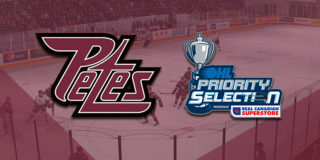 For the third consecutive game, it was the Petes that got on the board first. Overage forward Chris Paquette scored his first of the afternoon buy putting away a Ryan Merkley rebound on their second power play of the night, with Adam Timleck collecting an assist on the 6:42 marker. 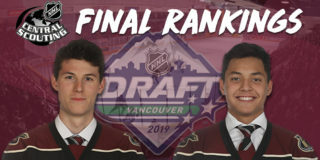 The Petes would jump out to their first of four, two-goal leads of the game after Semyon Der-Arguchintsev and Erik Cermak displayed some fancy stick work to connect with Brady Hinz at 10:53. Just ten seconds after a disallowed Mississauga goal, Cole Carter would get redemption for his club. The Steelheads won the draw, played the puck back to Liam Ham on the point, and Keean Washkurak and Carter connected to cut Peterborough’s lead to 2-1. A slight lead was held by Peterborough on the shot clock through 20 minutes, with the maroon and white capitalizing on two of four man advantages. After the teams exchanged penalties early in the second, the Steelheads would tie the game at 2. Alan Lyszczarzcyk worked the puck out of the corner to Thomas Harley on the point, finding Ham in front. He would go top corner over Hunter Jones’ blocker at 6:34. Peterborough would then score back-to-back goals to extend their lead to 4-2. Paquette put away his second extra man tally of the afternoon, this time tipping Merkley’s point shot off a pass from Liam Kirk at 7:24. Kirk would add a goal of his own at 8:59 for his second point of the game. Mississauga came back within one late in the frame after Washkurak capitalized on a miscue behind Peterborough’s net at 12:21 as Jones had no chance to react to the play. Eager to get back in front by two, Timleck battled to pick the puck off of a Steelhead defender before finding Nick Robertson alone to bring the score to 5-3 for his Petes. With nine seconds left to go in the period, Lyszczarczyk worked his hot hand against the Petes by squeaking the puck past Jones to again cut into Peterborough’s lead. An onslaught of Mississauga shots through the second period gave them an advantage on the shot clock through 40 minutes of Sunday play. Chad Denault scored his fourth of the season an an odd man rush in Mississauga’s zone with Max Grondin, connecting to bring the score to 6-4 for the Liftlock Lads 3:16 into the final frame. Jacob Ingham was pulled from his net in the dying minutes of the match as the Steelheads attempted a late comeback, but instead Brady Hinz capitalized with a long, backhand shot from in front of his own net to ensure his club’s 7-4 victory. Peterborough was perfect on the penalty kill, and 3/7 on the power play. Jones stopped 42 of 26 shots. Paquette, Washkurak, and Jones were named the game’s first, second, and third stars. 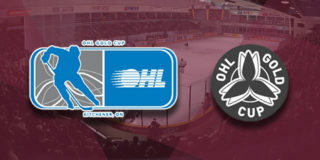 The Petes are back in action to kick off a three-game home stand on Thursday, January 10th at 7:05pm against the rival Oshawa Generals.